European Economic Area or short EEA includes most countries in Europe. The European Economic Area was established on January 1, 1994. 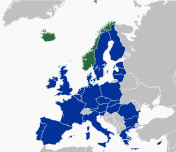 The European Economic Area is an expansion of the previous agreement between the member states of the European Free Trade Association (EFTA) and the European Community (later the European Union). Romanian and Bulgarian nationals intending to remain and work in the UK need permission to work before starting any job. More information is available at the UK Border Agency website. Nationals of these countries who come to reside and work in the UK need to register as Workers under the Worker Registration Scheme. Under the Immigration (EEA) Regulations 2006, Swiss nationals are included in the definition of "EEA nationals". Their family members are considered as if they were family members of EEA nationals. You can find more information about the European Economic Area in the AGREEMENT ON THE EUROPEAN ECONOMIC AREA (OJ No L 1, 3.1.1994, p. 3). You are also welcome to discuss European Economic Area in this discussion forum. Disclaimer: This web page is in no way, form or shape affiliated with any official or governmental organization. Even though we do our best to keep this web site current, information provided on this page may be out dated. Never use this or any other private web site to rely on your personal decisions or actions. It is your responsibility to check with the appropriate authorities, government, or offices for the most current information regarding your situation and/or actions. We can not provide any implied or expressed warranty for information provided on this page, site, or server. Basic fact: The European Economic Area covers most of Europe. The European Economic Area covers states of the European Union and the European Free Trade Association without Switzerland.